The change is forcing doctors to reassess how to communicate better about the shots. Pediatricians around the country are asked almost daily about delaying routine childhood vaccines — or refusing them entirely, according to a new study co-authored by a University of Washington expert. Nearly 90 percent of pediatricians encountered parents who opted out of vaccinations entirely in 2013, up from about 75 percent in 2006. And almost one in five parents asked to delay some or all of the potentially lifesaving shots. 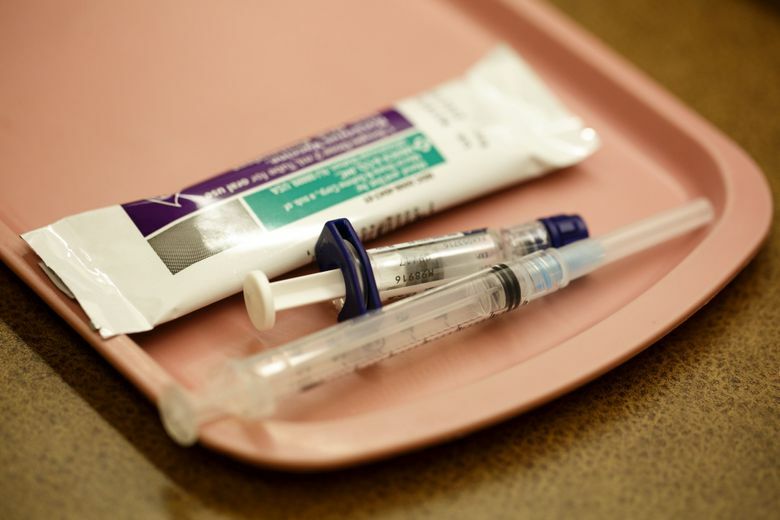 “I was a little bit surprised at the percentage of the general population that were delaying vaccines,” said Dr. Jon Almquist, a longtime Seattle-area pediatrician and clinical professor emeritus at UW. He is co-author of a study published Monday in the journal Pediatrics that examined results from two surveys given to more than 600 members of the American Academy of Pediatrics (AAP) in 2006 and again seven years later. It also found a rise in the top reason doctors say parents reject immunizations: They just don’t think they’re necessary. That’s worrisome, said Almquist, 76, who is nearly retired but still fills in for area colleagues. Public-health officials recommend vaccinations at specific intervals for most kids to prevent diseases that were once the scourge of childhood, including measles, mumps, rubella, pertussis and chickenpox. People who don’t follow the scientifically validated schedules for immunizations have been a growing source of worry for experts. Modern parents often have not been exposed to illness or possible complications caused by vaccine-preventable diseases, which might account for rising refusal rates, Almquist said. The study didn’t include input from parents themselves, just the doctors’ perceptions, Almquist noted. Still, what researchers found confirmed the experience of pediatricians across the United States, said Dr. Catherine Hough-Telford, 32, who was affiliated with the University of Alabama at Birmingham for the study but now has a private practice in Tampa, Fla.
Reports of vaccine refusals were highest in the West, with 94 percent of doctors saying they had parents opt out in 2013, up from 85 percent in 2006. Interestingly, the reasons parents refused vaccines shifted slightly during the study period. In 2013, about 64 percent opted out because of concerns about the disproved link between vaccines and autism, down from 74 percent in 2006. Nearly 67 percent of parents in 2013 refused shots because of worries about safety, also down from nearly 74 percent. At the same time, those who refused shots because they thought they were unnecessary jumped from about 63 percent in 2006 to 73 percent in 2013. In response, growing numbers of pediatricians reacted to vaccine refusals by dismissing such patients from their practices. In 2006, about 6 percent of pediatricians said they “always” dismissed patients for refusing vaccines. By 2013, that figure had jumped to nearly 12 percent, almost double. That runs counter to official AAP guidelines, reiterated in a new policy statement released Monday, that advises doctors to “continue to engage” with what are known as “vaccine-hesitant” parents in an effort to modify their views on the shots. In fact, doctors have little choice but to accommodate the growing numbers of parents with questions about vaccine delays and refusals, said Michael Belkin, a Bainbridge Island vaccine critic who said his infant daughter died in 1998 after a reaction to a recommended childhood vaccine. “The primary reason parents refuse vaccines is their children have suffered adverse reactions, the same adverse reactions listed in textbooks, vaccine package inserts and the federal vaccine court compensation table,” he said in an email. Almquist, Hough-Telford and other public-health officials say the science is clear: Vaccines are safe and effective, and adverse reactions, while possible, are rare. But they acknowledge that getting that message across to growing numbers of parents with questions is a challenge.